Fire, Earth, Metal, Water, Wood. These are the Five Elements of Taoist philosophy, showing the five aspects of our natural existence, and the importance of a delicate balance. 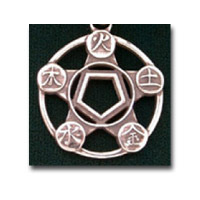 Also very useful in Chinese medicine, the elements are on the pendant in a clockwise order. It's called the "engendering" or "creation" cycle when you follow them in this order, one encouraging the other's qualities. It's called the "control" cycle when you follow them across from each other - that's what makes the star shape: fire controls metal, metal controls wood, wood controls earth, earth controls water, water controls fire, to restore balance when one element dominates the others. 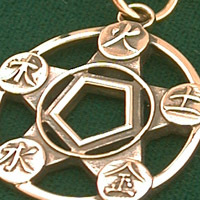 The pendant has been created to evoke an ancient Chinese coin, with more weight to it than many other Alythea pieces. Currently 19 guest(s) and 0 member(s) online.